Special 5-2 is the second level of Special 5 in Super Mario 3D Land. It is based off World 7-2. The player starts out in a room with several chained spiked cylinders, after passing these a Cosmic Clone spawns and chases the player through the next part of the room which contains several more chained spiked cylinders. 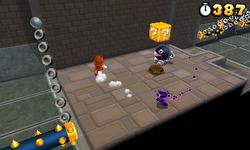 In the final segment of the chained spiked cylinders, a 1-Up Mushroom can be found. There is then a Door to the next area. In the next area, is the Checkpoint Flag and some seesaw platforms that have several Spiked Bars on them. After the seesaw platforms, is a fortress that contains two Chain Chomps and more chained spiked cylinders. After passing these, is this the Door that leads to the final area. In the final area are two seesaw platforms, the final one has a Spiked Bar on it, that lead to the Goal Pole. Star Medal 1: The player should hit the red ! Block in the first room thrice. This will create three large blocks that lead to the first medal. Star Medal 2: On a pair of Donut Lifts encountered shortly after the Checkpoint Flag. Star Medal 3: On a retracting spiked platform encountered after entering the fortress.